In this article, we explain how to set an AAAA record within the DNS settings of your domain name. The AAAA record is nearly identical to the AAAA record. With this type of record, you link a (sub)domain to a server by means of an IP address (think of a web server or a mail server). The AAAA record is for example used to make sure that the website on your webhosting subscription is available through your domain name. You can only enter IPv6 addresses when using AAAA records. IPv4 addresses can be set with A records. Where do I add an AAAA record? 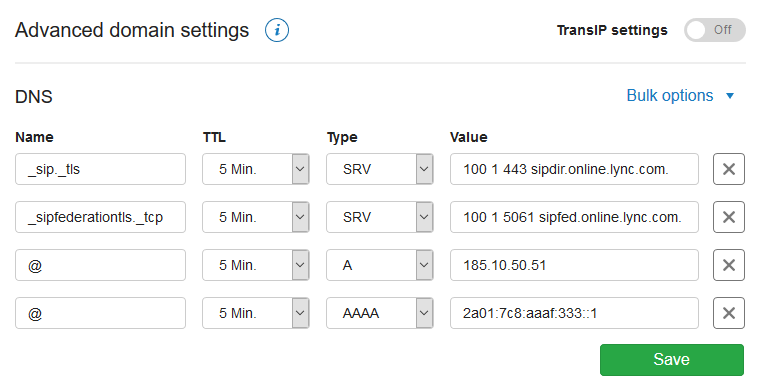 You can add all your DNS records easily and free of charge via your control panel. Go to the 'Domain & Hosting' tab and click the domain in the left column for which you want to set the AAAA record (do not check). How do I set an AAAA record? In the example below, you see an AAAA record for the site-example.com domain. This record is set for the main domain (without www in front) and points to the IPv4 address 2a01:7c8:3:1337::27. This is the IP address of our 'Reserved' page. If we enter site-example.com in the address bar of a browser, we will arrive at the TransIP 'Reserved'-page. You set an AAAA record by starting with the name. Here you specify for which part of the domain the DNS record should work. You can set an AAAA record for both your primary domain and a subdomain. If you want to set an AAAA record for a primary domain, enter an @ as a name. If you want to set an AAAA record for a subdomain, only enter the subdomain as the name (without putting the domain name after it). Our DNS software adds your domain name in the background. Below is an example of a correct AAAA record for the subdomain admin.site-example.com. Because we're configuring an AAAA record, choose 'AAAA' under 'Type'. As 'Value', you enter the IPv6 address of the server you want your (sub)domain to point to. Once you have added your AAAA record, click 'Save' in the bottom right of the DNS section. To make your primary domain with www in front of it accessible, add a DNS record with the name 'www'. Then choose CNAME as type and an '@' as value. This way, the DNS record for the subdomain 'www' always points to the same record as the A and / or AAAA record of your primary domain. Keep in mind that it can take up to 24 hours before changes to DNS settings to be implemented globally. This is related to the way external systems process these changes. You usually see these changes well within 24 hours. This article has discussed the setting of an AAAA record. For a general explanation about DNS records and entering them, see the article ‘What is DNS?'. If you want to know how to, amongst other things, set the AAAA records of your web hosting subscription, use the article 'The DNS settings of my web hosting package'.